This week we resume our conversations with Phil Dodson and Gwen Reitemeier. Jim joined us and shared why he enjoys the Edcamp model over more traditional PD. It all comes down to choice and just in time learning. Emily argues that there is still a place for regular PD as well. Nicole shared an experience helping a group of grade 3s get started with green screen for a trip to various structures around the world. What she hadn’t anticipated was the chance to show a student how to get started with Stop Motion Studio and seeing what he would create in only a few minutes. He was ready to be an expert and share his new knowledge with the class. Emily described her fun day at the Hackergal event put on by Melanie Mulcaster and Matt Arduini of Hillside PS and Clarkson SS respectively. A kickoff by CIO Adam Hughes The girls involved worked through challenges and coded in python. Not to worry, the boys weren’t left out. They explored MicroBit with Fair Chance Learning and InkSmith and did some designed and built some windmills with the help of Michael Pryce. Jim introduced us to a chrome extension called Insert Learning, which allows you to add instructional content into webpages and attach it as an assignment in Google Classroom. We’re taking time off for the winter break, but will be right back at it January 9th. In this episode we chatted with Phillip Dodson, principal of Ray Underhill PS. Later, we were joined by teacher Gwen Reitemeier and a couple of grade 5 students as they discuss how their experiences with Indigenous education has created a stronger sense of community in the school. This or That? Real Tree or Fake Tree? We landed on opposite sides on this one with Emily in favour of real trees despite the pesky pine needle clean up. While Nicole sided with the fake trees due to condo act restrictions. As promised, here is a photo of Nicole’s beloved Charlie Brown Christmas Tree. EML Teacher Leaders from across the board have been gathering for PD over the past two weeks. We reflected on how the open format beginning with provocations in the morning and an EdCamp style event in the afternoon provided these teachers with opportunities to share and learn from each other. If you aren’t quite sure what an EdCamp is check out the EdCamp site for more info. It is a great way to leverage the expertise of those in the room and to allow participants to drive the learning in the direction they need. Note: The interviews were so rich, that we have enough for a second episode, check out The Guardian Part 2 next week. This week we hung out with the Royal Orchard Middle School Boys’ club as they spend the afternoon exploring STEM activities in the LLC. Principal Kervin White, ISSP/Contact teacher Samantha Stephen, Instructional Coach Swarnaly Banerjee-Modi and a handful of students shared their experience. Do makerspaces need more than cardboard? Both Emily and Nicole agreed that cardboard is a great place to start, but that a makerspace should grow along with the learning that happens there. Often times we jump to the big ticket items, but if you take your time to carefully consider what makes sense for your learners and your space, you can make sure things don’t sit on a shelf unused. Cardboard is also great because it is so simple that you can really focus on the design thinking process. Nicole reflected on her experience at the Nelson Mandela Public School STEAM night for junior grade families and the importance of helping parents to understand some of the ways that school is changing to include the type of learning that happens in their Launchpad. Thanks to the team at NMPS for putting on a great night! Emily shared her excitement about being a Core Values judge at the FLL tournament recently held at Rick Hansen SS. She described a collaborative challenge to have one team member reconstruct a Lego project by listening to the instructions of the remaining team members. Speaking respectfully and ensuring team members had their voice heard went a long way for the teams who were successful in the task. A special shout out to Guidance teacher Dinusha Gunasingham and Teacher Librarian Terri Yates who weren’t in on the day we recorded but are involved in the Boys’ Club. This is what it looks like when we hit the road with our podcast. In this episode we chatted with Jaime Girard – Intensive Support Teacher for the board’s primary and junior interval classes. She discussed her prior experiences as an interval teacher as well as how she currently supports interval programs in her new role including an exciting invention convention event. This Or That: Google Keep vs Post Its? Google Keep is a cool app to keep track of all sorts of things. Create ToDo lists, set reminders, and add tags. This #TipsinTwo can help you get started! If you can’t let go of your Post Its but want a way to digitize them, check out the PostIts Plus app. What’s new in the world of EML? Emily shared about the fantastic new Tool Lending Library. There are a number of technology kits ranging from VR creation to MaKey MaKey steam now available for sign out through the Modern Learning chiclet on the intranet. It is a great opportunity to try before you buy, and we are hoping to build a bank of activities, and lesson plans created by the teachers who sign them out. A few tweets from the first annual invention convention! Ask your students what they might like to invent and get them to sketch out their plans. This introduction to the first steps in design thinking can catapult them into further creative thinking. We’re back! Emily and Nicole are now The Returned. We want to thank you so much for your patience while we got things started with the second season of the Empowering Modern Learners Podcast. We have been looking forward to getting our first episode out since last season. There has be a lot of learning on our part and we are elated that we’ve finally been able to get things underway. We are going to try a few new things out, but the heart of it all will continue to be stories from educators on their journeys to empower our modern learners. Nicole shared an exciting opportunity for grade 6 and 9 teachers to be involved with the Let’s Talk Science: Living Space Project in which classes will monitor the environmental conditions of their classrooms by coding Micro:bit to collect and display data from a sensor board. The PD opportunity takes place on Saturday November 24th from 9am-1:30pm and teachers who register, attend and commit to completing the project will receive a kit with everything they need. For full details or to register for remaining spots, check out MyLearningPlan (aka Frontline). Emily shared about the amazing Empowering Modern Learners parent conference from the beginning of the month. 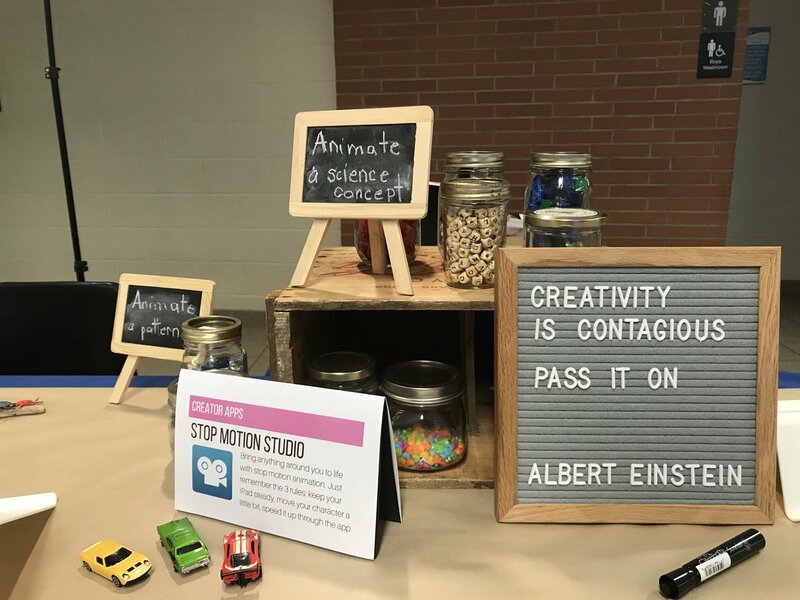 A new format allowed facilitators and parents to interact more fully than during years past moving from traditional sessions to tabletop displays. She described how a conversation about reading with your child at home, moved right through to 3D printing. Check out some of the tweets from the conference. Connect with someone from an industry related to a subject that you teach. Whether in person, via e-mail, Twitter or using a tool like Google Hangouts, allow your students to see how what they are doing in school can relate to real careers. We’re tried to do a ‘mic drop’ in this photo… but the mics ended up getting blurred so they’re hard to see. Thanks for listening this year! Welcome to the final episode of Empowering Modern Learners for Season 1, the 2017-2018 school year. In this episode, Jim and Amit look back over the season and highlight a few favourite moments from guests they have interviewed. They also listen to some bloopers from the past 34 recording sessions and share some laughs. Nicole James and Emily Farkas also join in and talk about next year’s podcast. In this episode, we interview Adrian Graham who is the Superintendent of Curriculum and Instruction at the Central Board Office here in the Peel District School Board. Adrian shares his own journey through Empowering Modern Learners and he encourages teachers to continue to be co-learners with their students so they can be empowered as well. He also talks about some of the upcoming events and opportunities teachers have to learn in Peel about Empowering Modern Learners. Nicole shared about using Google Earth and Google Maps to give grade 3 students better context for comparing communities in Ontario. Being able to explore points of interest, examine different physical features and get different perspectives (street view, arial etc.) students were able to make some inferences about the communities. It also lead to great questions and conversations. Along the lines of making things more real for students, Nicole also mentioned BBC CivilisationsAR App for Android and iOS, which puts amazing artefacts right in front of you, through your device. With additional information and audio support you can bring the museum right into your classroom. Emily shared about the Coding Playground at Maple Wood P.S. this week. Students and educators were learning together about the concepts of coding, such as how we use symbols in block coding to represent commands and how to design challenges to support the Math Curriculum. Students collaborated to problem solve predetermined coding puzzles and then quickly moved on, to creating their own challenges. This is one example of how coding can support the many layers of the EML Vision document. Jim shared a recent blog post he made about summer learning. One of the ideas he would really like to encourage colleagues to consider is to take on a project that focuses on a passion or an interest. This is something he looks forward to each summer. The idea is to intentionally outline a project one will take on over the summer that’s centred on an interest one has. Make as the project goal achieving flow as Mihaly Csikszentmihalyi describes it. The professional learning comes as a result of the reflections one makes about the experience and the learning that happened. Amit shared the work that is being done at Central Peel Secondary School by Justin Schikschneit and his students around the podcast series they created in their grade 12 law class. It is a great example of Project Based Learning as a different Model of Learning and really speaks to the Belief Statements in terms of believing that your learners are able to accomplish something like this. Justin can be found on Twitter where he will share more information about the project moving forward and where the podcasts can be found.